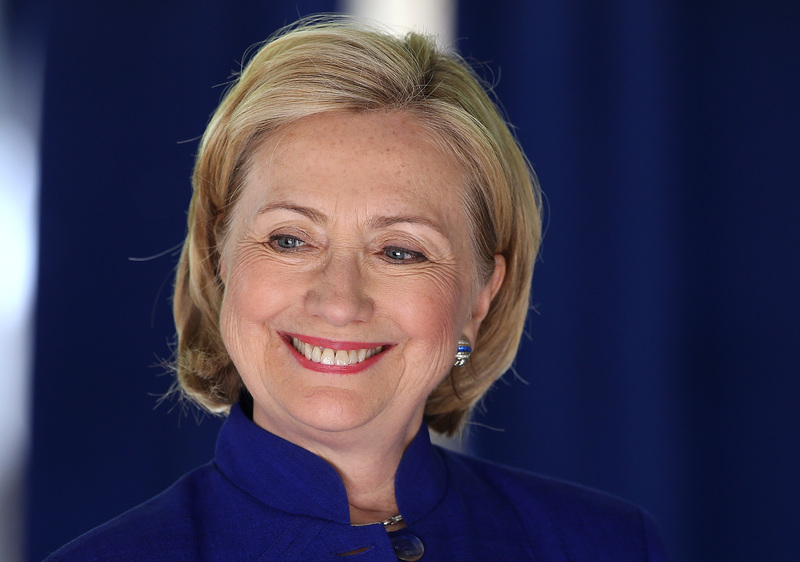 It's finally official — Hillary Clinton is running for president. Clinton supporters have long awaited this day and have been creating Hillary Clinton campaign art and slogans for the political queen for years. Before the announcement, "Run, Hillary Run!" was plastered on bumper stickers and buttons, then there was "Ready For Hillary," but now that the campaign is really happening, the chant is switching over to "Hillary 2016." There's no shortage of great photos of Clinton, and the Internet very much enjoys using her face for memes and inspirational posts. There's even an Instagram for Danish Clinton supporters dedicated to using her face for memes, both silly and serious. You could really put "Hillary 2016" on top of any photo of the political diva and it would be a beautiful work of art, though. On top of campaign art, there's also a whole world of Clinton merchandise out there that any true supporter needs to stock up on pronto. How much "Hillary 2016" stuff is too much, you ask? There's no such thing. Between t-shirts, buttons, pins, and jewelry flaunting her face, there's no reason to go a day without wearing at least one Hillary-themed item. Here's a glimpse at some of the "Hillary 2016" campaign art and the best Clinton products we all need in our lives. This beautiful print, for sale on Etsy, was made in the hope that she would run for president in 2016 and now that she is, we could all use this masterpiece as the focal point of our living rooms. That might get really confusing if she becomes president, but I think America can handle it. #RunLikeAGirl doesn't only apply to jogging. Clinton is running like a girl and then she's going to run the country like a girl. This "Hillary 2016" poster makes Clinton look very regal and powerful, so it's pretty realistic. Even Bill gets a piece of the action, since he will be the first First Gentleman. This hand-drawn pin is so adorable. Every Clinton fan needs one. If she wins, Clinton will literally run the world. Your favorite politician can always be close by with these Clinton earrings. And if you're truly dedicated to Hillary 2016, you'll paint your car as campaign art like this person did.